Home Chiropractic Blog Put Your Smartphone Down and Drive! If you are one of those drivers who believes that you are talented enough to text or use a smartphone while driving, you are mistaken and you need to stop immediately. Put your smartphone down and drive. I’m not talking about sending a text or checking your updates really quick at the stop light. No. I’m talking about literally texting and driving. The reason people mistakenly believe that they can successfully take their eyes off the road for a few seconds to send a text message is the misconception of distance traveled in a “few seconds.” Most people think that taking their eyes off the road for a quick second is fine, and “nothing can happen in a few seconds.” Well, that’s where most people are wrong. According to the United States Department of Transportation Federal Motor Carrier Safety Administration, at 55 mph, it will take a vehicle less than five seconds to cross an entire football field (fmcsa.dot.gov, 2009). Five seconds is usually the length of time a person takes their eyes off the road to read a text. Think about it: Would you drive 100 yards on the freeway blindfolded for five seconds? Well, theoretically, that is what you’re doing. It’s even scarier to think that some people even do it on residential streets. The U.S. Department of Transportation National Highway Traffic Safety Administration have reported that “In 2013, there were 3,154 people killed and an estimated additional 424,000 injured in motor vehicle crashes involving distracted drivers,” and the top reason for distraction was a smartphone (crashstats.nhtsa.dot.gov, 2015). If you’ve been involved in an auto accident, the most important action you should take is to seek medical attention immediately. After the swelling has decreased and depending on your condition, a chiropractor may be able to help you recover from injuries such as whiplash, headaches, back pain, lower back pain, and shoulder pain. Call your local chiropractor to schedule an appointment today. 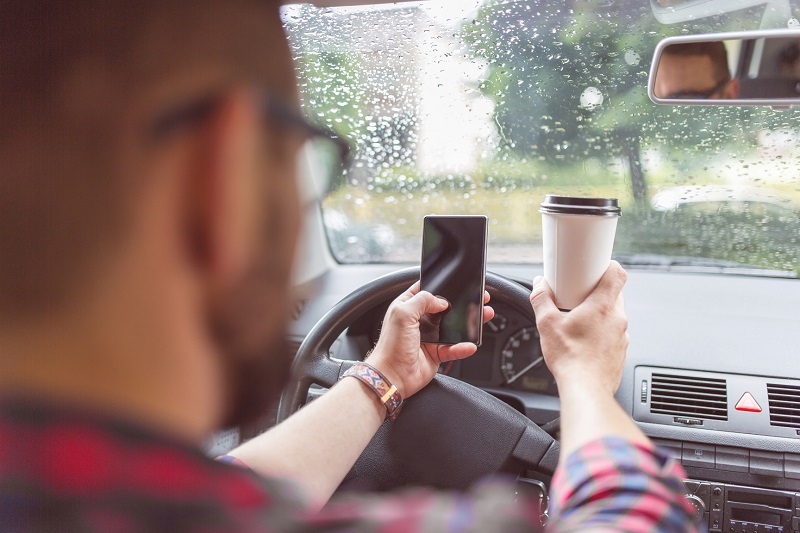 The U.S. Department of Transportation National Highway Traffic Safety Administration also concluded that the majority of distracted drivers that were involved in fatal auto accidents were distracted by their smartphones. “Drivers in their 20s are 23 percent of drivers in all fatal crashes, but are 27 percent of the distracted drivers and 38 percent of the distracted drivers who were using cell phones in fatal crashes” (crashstats.nhtsa.dot.gov, 2015). However, drivers who are aged 15 to 19 years old are reported as being the “largest proportion of drivers” that were distracted at the time of being involved in an auto accident (crashstats.nhtsa.dot.gov, 2015). State Farm also reported that owners of smartphones have increased by 80 percent over the past two years (Statefarm.com, Holly Anderson, 2015), which means there is the potential for more distracted drivers on the road in the coming years. Although distracted drivers can cause a lot of damage, they can also be injured. An unexpected auto accident has the potential of causing severe whiplash, dislocated cervical vertebra, broken limbs, or eye damage. These injuries can increase in severity based on the unexpected impact that occurs. When the driver is distracted, their focus is on the object, so if they strike a car or property, the unexpected impact can cause the muscles to strain or tear easily. In fact, this is the same type of injury that can occur to a person who is rear ended and suffers whiplash. Whether you are the victim of a driver who was distracted or you are the distracted driver who was injured, a chiropractor may be able to help you recover from your injuries, depending on your condition and severity of injury. Keep in mind that chiropractic care is not a cure to for any injury, and it is not suitable for everybody, as some injuries may require the attention of a nerve specialist or surgeon. Chiropractors focus on back and neck injuries and freeing the spine of subluxations to allow the nerves that extend from the spine to communicate freely with the rest of the body. When the nerves are able to communicate without impingement, blood flow is able to increase and allow the body to heal naturally.